When Otis Redding and Atlantic staffer Joe Galkin started the Jotis label in 1965 I'm sure they were looking for hits - after all nobody does it to lose money. But while sales at the time were disappointing - only Arthur Conley went on to make a really successful career - the label's legacy is a strong one. Not just for the Otis connection but for the quality of the music. 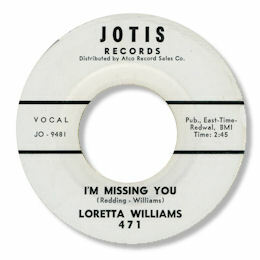 All four releases are excellent southern soul but the forgotten one out as far as deep soul fans is this one - the only 45 that Loretta Williams made. She came from Mobile, AL and was a featured artist in the Otis review for a time. The dance side "Baby Cakes" is a highly infectious thumper well known to Northern soul fans but the wonderful ballad flip had been pretty much overlooked until it appeared on an Ace UK CD a few years ago. I'm Missing You is a lovely heartfelt ballad well sung and superbly arranged. But where was this cut? Otis used both Stax (Arthur Conley) and Muscle Shoals (Billy Young) for his productions but this one doesn't sound like either studio to me. The guitarist could be Reggie Young so I'm plumping for Memphis - Lyn-Lou or Sam Phillips - but am open to persuasion. UPDATE ~ Bob McGrath (see Links) writes with details of Loretta's session in New York on 13 September 1965. Players were John Farris, John W Cook (tp) Norman Sellers (tb) Robert Holloway, Robert Pittman (ts) Albrisco Clark (bs) Leroy Glover (org) p (by Glover or poss Otis Redding) Jackie Herndon (g) Everett Hollins (b) George Weaver (d) arr & dir by McCoy Robinson (uncredited) prod by Otis Redding (uncredited). That info makes sense as many of the guys on the session were members of Otis' road band art the time. I'm grateful as always to Bob for his info. FURTHER UPDATE ~ I'm delighted to say that Loretta herslf has been in touch with me. She is now know as Loretta Williams Jackson and lives in Mobile, AL. She writes to say that she is now "a Gospel recording artist now and the writer of a new book called "The Woman Who Lived Twice," the story of my life on the road with the late great Otis Redding's Show, this is a movie book waiting to be made, plus I have a new hit record that's waiting to be heard called "The World we Share." She is setting up a new website at www.lorettawilliamsjackson.com and will soon be on Facebook and Youtube. I'm sure everybody will wish Loretta good luck in her new venture. Note ~ "I'm Missing You" can be found on the Kent UK CD "Dave Godin's Deep Soul Treasures Vol 3".